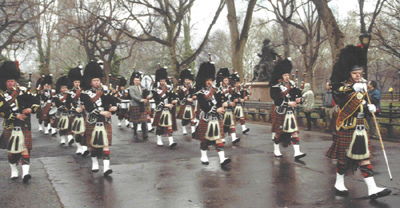 After the U.S. Senate officially recognized Tartan Day in 1998, Alan Bain, Chairman of the American Scottish Foundation, was tasked by The Scottish Coalition USA to organize a Tartan Day celebration for New York City and in 1998 the first Tartan Day Parade, consisting of two pipe bands and a small but spirited group of Scottish Americans, including Grand Marshal, Cliff Robertson, walked on a sidewalk from the British Consulate to the United Nations. The first permitted parade was in 1999 in Central Park. Since then it has flourished to include many bands and thousands of participants, including clan members and individual marchers. In 2002, as part of the Tartan Day celebrations the Parade was brought to 6th Avenue for the first time. 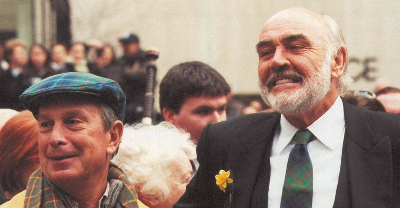 This Parade attracted a record number of pipe bands from all over the World and was led by Sir Sean Connery and Mayor Michael Bloomberg. With the New York Tartan Day Parade growing the Saint Andrew's Society of the State of New York, 1756, New York Caledonian Club, 1856, and The American-Scottish FoundationÂ®, 1956. came together to form the The New York Tartan Day Committee. Since 2002 the Committee has grown to include members from Clan Campbell. The NYTDC, which has 501(c)3 status, is charged with maintaining and perpetuating the New York Tartan Day Parade and co-ordinating the events that complement it. Numerous groups and societies throughout Canada and America have taken the anniversary of the Declaration of Arbroath (April 6, 1320) as their national date to celebrate their Scottish roots. Tartan Day is now celebrated throughout the United States with the largest celebration being the New York Tartan Day Parade. The adoption by the US Senate would not have occured without The Scottish Coalition taking up the mantle in the United States to see Tartan Day recognized as it is today. TSC USA learnt in 1996 of the actions taken on December 19, 1991 by the Ontario Legislature who passed a resolution proclaiming April 6 as Tartan Day. TSC USA led the American initiative which led on March 20, 1998, to Senate Resolution 155 (S. Res.155), proposed by US Senate Republican majority leader, Trent Lott, was passed unanimously. This was followed by companion bill House Resolution 41 which was passed by the U.S. House of Representatives on March 9, 2005 - and by Presidential Proclamation on April 4, 2008. Whereas April 6 has a special significance for all Americans, and especially those Americans of Scottish descent, because the Declaration of Arbroath, the Scottish Declaration of Independence, was signed on April 6, 1320 and the American Declaration of Independence was modeled on that inspirational document; Whereas this resolution honors the major role that Scottish Americans played in the founding of this Nation, such as the fact that almost half of the signers of the Declaration of independence were of Scottish descent, the Governors in 9 of the original 13 States were of Scottish ancestry, Scottish Americans successfully helped shape this country in its formative years and guide this Nation through its most troubled times; Whereas this resolution recognizes the monumental achievements and invaluable contributions made by Scottish Americans that have led to America's preeminence in the fields of science, technology, medicine, government, politics, economics, architecture, literature, media, and visual and performing arts; Whereas this resolution commends the more than 200 organizations throughout the United States that honor Scottish heritage, tradition, and culture, representing the hundreds of thousands of Americans of Scottish descent, residing in every State, who already have made the observance of Tartan Day on April 6 a success; Whereas these numerous individuals, clans, societies, clubs, and fraternal organizations do not let the great contributions of the Scottish people go unnoticed: Now, therefore, be it Resolved, That the Senate designates April 6 of each year as "National Tartan Day".